It’s been awhile since I roasted a chicken. I think about a month and a half. That’s a long, chicken-less time for a chicken-lovin’ fool like myself. I have some plans for the leftovers of this little beauty, so stay tuned. 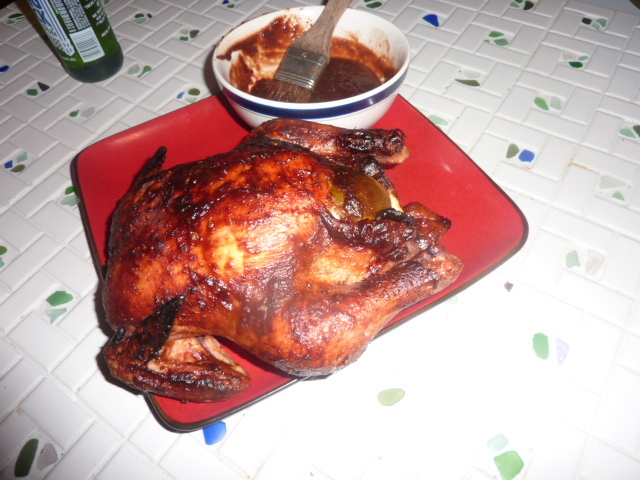 This chicken was finger-licking good – sweet from the hoison, spicy from the sriracha, and tangy from the lime. The skin was crispy and sticky and salty and sweet. As always, see my recipe for Perfect Roast Chicken for a step-by-step how to on how to roast the perfect chicken. 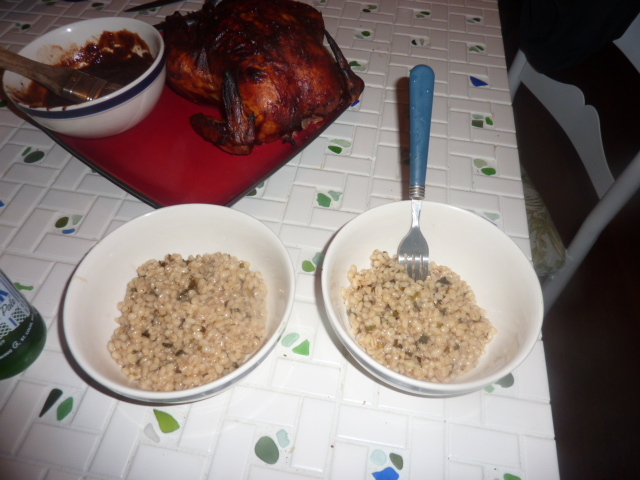 The barley had a lovely citrus bite that worked well with the sweetness of the hoisin. As you can see from the picture after the jump, Roo Bear was hoping for a few bites. He even tried to climb up on the counter while the chicken was cooling so I could shred the leftovers. He’s a bad Roo Bear. A cute one, though. Remove chicken from brining solution by straining through a colander. Make sure you save all brining ingredients. Dress the chicken with lemon, celery, garlic, ginger, bay leaves, and cloves. Season freshly cracked black pepper and 1 tsp. coriander. Allow the chicken to rest overnight, at least 18 hours. This allows most of the moisture to evaporate from the skin of the chicken, which will result in a crispier skin (my favorite part!). 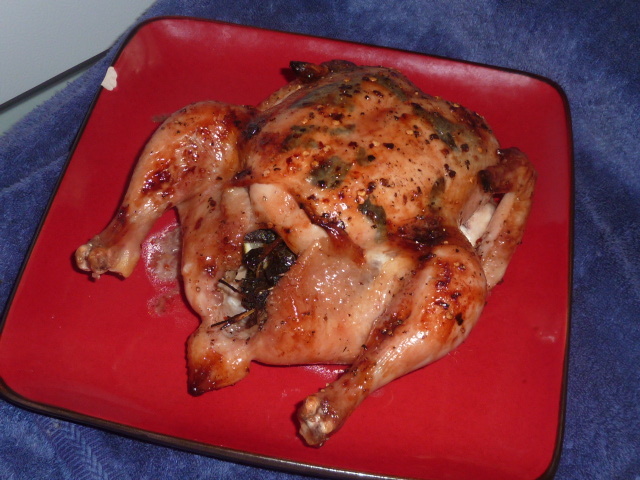 Remove chicken from refrigerator and place on a baking dish on top of a roasting rack. Juice 1/2 lime over the chicken, using a pastry brush to cover most of the exposed skin if necessary. Add lime to chicken’s cavity. Place chicken in preheated oven on center rack. Roast at 475° for 15 minutes or until skin is light golden brown. After 15 minutes, reduce heat to 350°. Roast chicken roughly 20 minutes per pound (rounding up to nearest pound), or until meat thermometer inserted into the thickest part of the chicken’s thigh reads 165º (yay, FDA, for lowering the safe internal temperature!). If chicken becomes overly brown, tent with a piece of tinfoil. While chicken is cooking, whisk together hoisin, sriracha, and juice from 1/2 lime. With 15 minutes left in cooking time, use a pastry brush to coat chicken with hoisin-sriracha glaze. In a medium sauce pan, bring chicken stock to a boil over medium-high heat. Add pearled barley and reduce heat to low. Simmer 45 minutes until barley is cooked through and most of liquid is absorbed/evaporated. It will be tender but chewy. Add olive oil, lime juice, fresh mint, and fresh sage. Combine thoroughly. Although I have already posted a lovely recipe for the Perfect Roast Chicken, the chicken I roasted to pair with the Fall Salad with Roasted Garlic Vinaigrette was so divine I thought I would give it a post of its own. 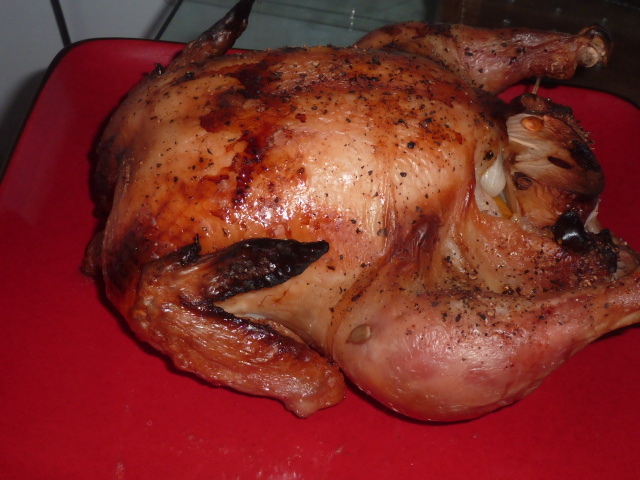 I suggest you read the Perfect Roast Chicken recipe, since the head notes are very helpful (in my humble opinion). However, I did make a change to the preparation of the chicken pictured above that I will never fail to do without again. Rather than leave the bird to rest in the refrigerator for 2-4 hours, I let it rest, dressed with lemons, onions, garlic, apples and peppercorns and seasoned liberally with freshly cracked black pepper, for about 18 hours. Despite the fact that I did not bother to baste the chicken (I never do), this was the crispiest, most flavorful skinned chicken I have ever eaten. The brining solution outlined below imparted a great flavor to the flesh of the chicken. There was a hint of tartness from the lemon and spiciness from the peppercorn balanced wonderfully by a sweet, decidedly “apple-y” taste. Paired with the Fall Salad with Roasted Garlic Vinaigrette, this was a perfect and healthy meal. Remove chicken from brining solution by straining through a colander. Make sure you save all brining ingredients. Dress the chicken with lemon, onions, garlic, apple, and peppercorns by shoving deep into the cavity. Season liberally with freshly cracked black pepper. Allow the chicken to rest overnight, at least 18 hours. This allows most of the moisture to evaporate from the skin of the chicken, which will result in a crispier skin (my favorite part! ).